Thanks to the inescapable heat and oppressive humidity, August is nobody’s favorite month in Southwest Florida. But if you’re like me, and love chasing juvenile tarpon with a fly rod, these intensely hot summer days are the best time of the year. As far as I’m concerned there is nothing better than jumping the 10 to 20 pounders that pop up on the flats right now. The slick calm mornings and 90 degree water temps force these small tarpon to gulp air from the surface several times an hour. This behavior is called rolling, and it’s something these fish must do in order to survive. The prehistoric tarpon has a highly evolved internal air bladder lined with red blood cells that also functions as a rudimentary lung. This allows tarpon to live in both fresh and saltwater and the juveniles can thrive in oxygen poor water where few predators dwell. 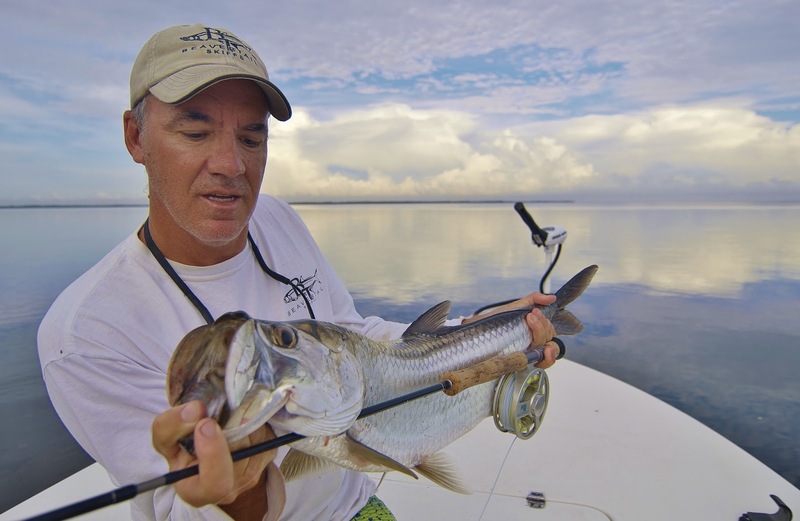 For those of you non-snowbirds stuck here in August, right now can be your best shot at a tarpon on fly. These smaller fish are mostly unpressured, especially during the weekdays. Juvenile tarpon are usually an early morning species and they eat the best at sunrise. Almost any basin can hold them provided the water is at least 3’ or deeper. Calm conditions are essential for getting them to gulp at the surface. Once the wind kicks up these small tarpon roll far less frequently and the chop provides extra camouflage. On a perfectly flat morning you’ll not only spot them easily but also hear them taking air from a good distance. It’s a quiet but unmistakable sound and can lead you right towards a pod of hungry fish. The biggest drawback to chasing juvenile tarpon right now is the water itself. Thanks to the heat and frequent rains, most of SW Florida’s inshore flats look like a freshly brewed cup of coffee right now. When the rolling fish drop back below the surface, our tannic stained water makes it tough to determine where they’re going. The best way to get a hook up is to actually hit them with a fly while their heads are above the water. If you’ve ever played the old arcade game Whack-A-Mole, you’ll understand this kind of fishing. Throwing bushy white flies, like Seaducers or deer hair Sliders, usually works best for my anglers. Finally, and most importantly, remember that dragging these under 40” fish onto the deck isn’t illegal, but it shouldn’t be done. Hold them like you see in the photo on this page and you’ll be doing them a favor. These small tarpon can live a very long life, maybe 50 years or more, so fight them hard and release them quickly, and you might meet them again in a few decades when they’ve put on a couple hundred pounds.